Getting Started In UX: What’s your one thing? Jason Goldberg, founder of Fab.com, wrote a great blog post about the only question your startup needs to answer, “what’s your one thing” (sorry, the blog post is no longer available) t online anymore). The premise of the post is that throughout his career as a serial entrepreneur, he’s realized that to be successful, you need to have a laser focus on one thing. So why is it important to identify this one thing? Without that focus, that thesis if you will, you risk not having some type of guiding principle or compass helping you navigate the twists and turns that come with product and business development. That one thing will help keep your team focused on that over-arching theme or goal and hopefully minimize the time that you can so easily spend being stuck in the weeds of features, pixels, and process. 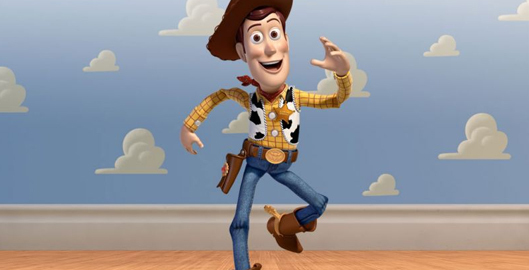 All well drawn characters have a spine — an inner motor, a dominant unconscious goal that they’re striving for, an itch that they can’t scratch. 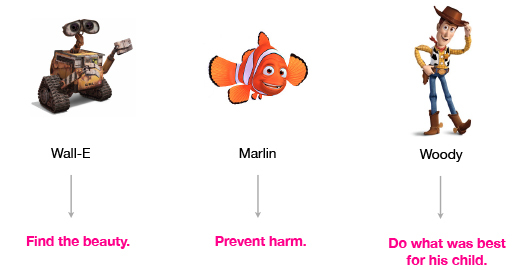 This got me thinking, the same notion of a character having a spine or an unconscious goal can be applied to the customers (or as I like to say, characters) of the products we make. If you’ve created a great product, you’re fulfilling some type of goal or tangible need. But at the same thing, the reason that people remember your product is that the experience created created some type of emotional connect. I think the reason that companies like Fab, Rent The Runway, and Uber are so successful (and haven’t died yet) is because they’ve created a loyal following — because they tapped into creating an emotional experience. 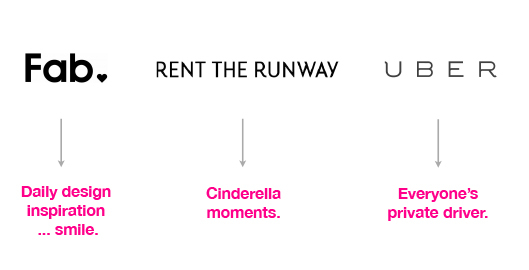 Now, of course, when I rent a dress from Rent The Runway, as a consumer I am not thinking “I want to have a Cinderella Moment”. Instead, I’m thinking “I want to look hot at this event”!!!! When I use Uber, I’m not thinking “I want to feel like a rockstar with a private drive”. Instead, I’m thinking “I can’t find a cab, it’s raining, I need to get to ________”. The point here is that these spines or unconscious goals are really a way to help bring your entire team and company into the shoes of the consumer’s story and help everyone easily remember and rally around that one thing that you as a team have decided to pursue. So, next time you find yourself debating some feature or unsure of a big decision, take a step back and consider if that decision or feature delivers on that one thing.